"Immediately after World War II, Colorado was a ripe market for a business targeted to mountaineers and skiers. 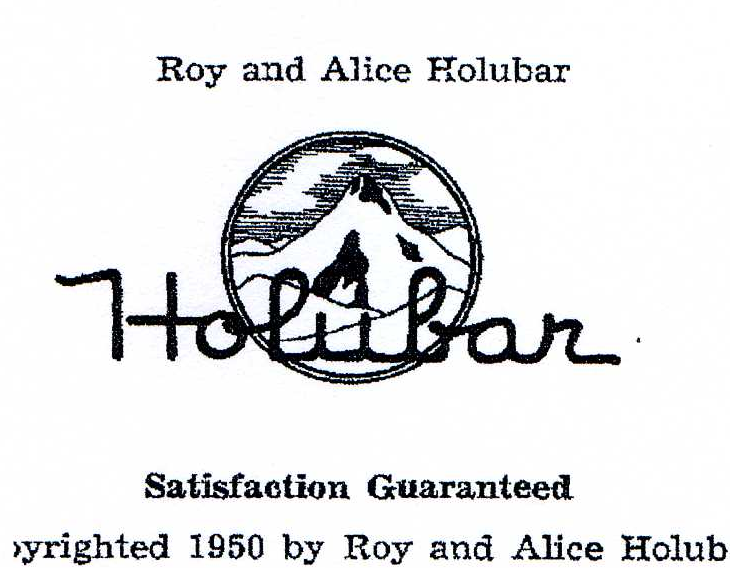 In Boulder, Colorado, Alice and Roy Holubar officially opened for business in 1947 by purchasing a business license.... Roy and Alice had met as Juniors in High School, and were fellow students at Colorado University (CU). Roy graduated in 1936 in engineering and taught there until the demands of Holubar Mountaineering became too great in the later 1960s. In his youth, Roy had been an active outdoorsman, primarily hunting and fishing. During the late 1940s, they catered to the equipment needs of Roy's companions in Colorado Search and Rescue, and to the needs of the hundreds of 10th Mtn. troops who had either stayed, been a part of Camp Hale, or migrated to Colorado after World War II... One climber remembers that in the late 1950s you'd walk down a walkway at the Holubars' house on Grandview Ave, go through a gate into the backyard, and enter the basement via a stairway to find Alice hard at work sewing!